Prime Kicks Vol.1 – 125 professionally crafted, creatively layered, severely-processed-with-all-kinds-of-fancy-gear samples. Tags: Deep House, EDM, Electro House, Minimal, Progressive House, Tech House, Techno, Trance. 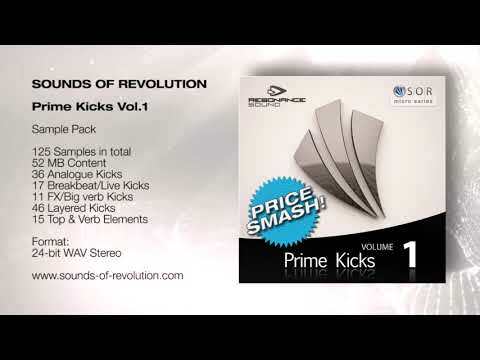 Micro is beautiful: Oliver Schmitt aka SOUNDS OF REVOLUTION (SOR) continues his highly anticipated Micro Series with some decent tools to dust off your subwoofers: Prime Kicks Vol.1 for an unbeatable smashing price! It’s not exactly a secret that only a proper bass drum delivers your tune perfectly to the dance floor – and this is your chance to get it just right: 125 professionally crafted, creatively layered, severely-processed-with-all-kinds-of-fancy-gear samples. Suitable for everything EDM and paying attention to every detail as usual, SOR sends you his best regards with beautiful analog, breakbeat/live, fx, verb and heavily layered kicks. Please note: everything other than the kick samples in the demo are not included in this release but taken from other SOUNDS OF REVOLUTION products. So what do I think of Prime Kicks Vol. 1? It’s great and affordable. The kicks, especially the analogue ones, are deep and fat – lots of oomph. The FX kicks are my least favorite, but they are there if you need something extreme with plenty of reverb tail. If you’re an EDM producer, you’re going to love this pack as the majority of the kicks sound great. There are also plenty to choose from.